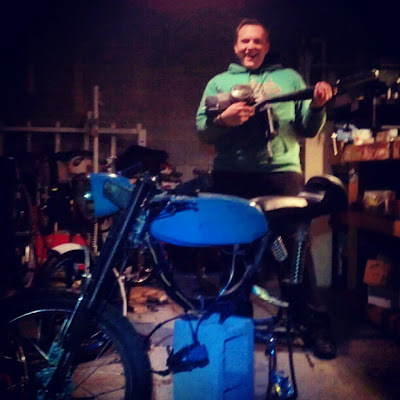 It has been cold, but that hasn't stopped my moped fun... I worked a little in the garage last night and now my hands are chapped. Sure do miss a semi-heated garage. So here is the deal tonight. 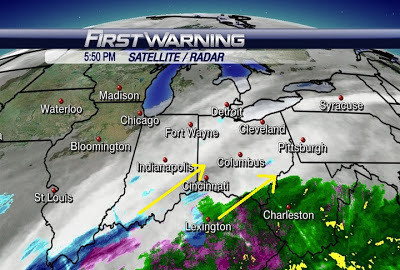 Far Southeastern Ohio will see a bit of an icy mix and rain. 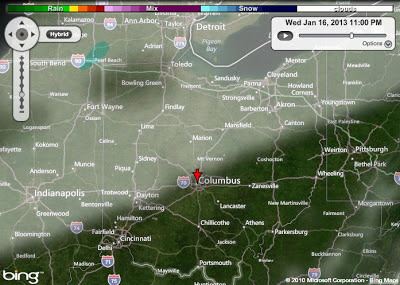 The closer you get to Columbus or I-71 you will transition to freezing rain and then light snow just to the east of I-71. Much of the areas north and west of the state will not see a lot of action. You can see the radar above. Here is the futurecast image from 5AM and you can see the ice line just to the east of Cincinnati and the ice band stretches up toward Zanesville. By Wednesday night we could see a few flurries. The models are not showing very much moisture at all, but you can make out a little snow up by Fort Wayne for Wednesday night. Thursday morning should not look much different on the roads. No accumulations are expected. Long term outlook: We slowly warm up for Friday and Saturday with highs getting into the 40's, but then a sharp drop in temperatures for early next week... we could be looking at highs only in the teens. I will keep you posted. I took a vacation day for tomorrow and visiting some friends. Drive safe tomorrow morning and have a good one! One final addition... systems like tonight are more of a "now-cast" meaning that current temperatures may adjust the snow/ice/rain line. Make sure to catch the evening forecasts with Bill Kelly on ABC6 and FOX28 for the latest on any minor changes. FRIGID temps on the way. Motion Left & FRIGID temps coming! Busy enjoying the warm temps! Gettin it! On the way: Rain and Ice?? ?